ONE SHEET "HAIRY BACK" BOOTLEG. NOT AN "ORIGINAL MOVIE POSTER". For 1000's of Vintage Movie Posters. If it has any minor defects like pin holes, creases, etc. And they are not mentioned above, they should be visible in the high resolution photo. Please examine it closely or if you would like a more detailed condition report please message us. Perfect for a high end home theater. Highly sought after by movie poster collectors and aficionados. This is what all you. Fans have been waiting for! One of the most famous movie poster "bootlegs" in history. Measures a full 27" x 41". Printed in the late 1980's. There is a small "hair" on the back of Leia. This is the tell-tale sign that it is a bootleg and NOT an original. We offer this to other dealers and collectors for reference and educational purposes so they can compare it to known originals. We have stamped the back of each one a few times with a 1/2" x 2" permanent ink stamp that says: " THIS IS NOT AN ORIGINAL MOVIE POSTER ". This will make it extremely difficult for anyone to mistake them for originals (or to possibly try and pass them off as such) at some time in the future. If someone tries to linen back one to hide the stamps, I would expect (and hope) that the linen backer will be honest and do the right thing and NOT do it. Back in the late 1980's someone got their hands on the original printing elements for 3 Star Wars one sheets. The Style A version 77/21-0, The Style B Teaser Advance, and the Style C International. They illegally printed untold thousands of posters. The quality of them is first class, they are extremely convincing!! They were most likely printed at the same place where the originals were (an NSS printing facility), except it was done "after hours" by unscrupulous employees. But bought them anyway, and some refused to have anything to do with them. They even distributed many of them to members!! As soon as they found out they weren't authentic one sheets they stopped distributing them and were most likely destroyed. They measure a full 27" x 41". There are subtle printing defects / differences between originals and reprints. On the Style A there is a small "hair" right below Luke's belt PICTURE. There are other slight differences, but this is the one everyone focuses on. The paper quality is first rate as well, we see virtually no real difference when comparing fakes to originals except that the paper may be ever so slightly thicker on the fakes. Some have said that the fakes have a different sheen. If they do it is very slight. These bad guys usually try to legitimize them. They swear up and down that the reprints are real, that they are an alternate printing, or a scratched plate version, or from a warehouse find, or a garbage run from the factory etc. Their excuse always seems plausible. They know they are not authentic, yet they really don't care. Since word about these fakes has spread and it has become common knowledge in the collecting community (and thus, more difficult to sell), these shady dealers have begun to lightly fold them, put pin holes in them, and even get them linen backed to try and make them appear more authentic. How do you expect them to determine what is real and what is not? Unless they are ever contacted by Lucasfilm (which we really don't see happening as they closed the book on this 20 years ago) the rip off of new Star Wars collectors will continue. As soon as she realized she was ripped off and that they weren't real, she put them in a closet and tried to forget about them. She realized that she should have known better, that it was too good to be true. They are all in Near Mint to Mint unused condition. This is an extremely high quality bootleg poster. We are absolutely certain it is NOT AN ORIGINAL AUTHENTIC MOVIE POSTER. We use super strong hi-quality packaging materials including thick cardboard, masonite, and costly pvc plastic pipe. Please be advised that over 95% of all Original Movie Posters. Also please note that most movie posters were actually used at the theater, and some will contain slight imperfections such as: writing on the back, pin holes, fold wear, small tears, etc. These are all very common and to be expected, but if they bother you, all these minor flaws can be remedied in the linen backing process. Linen Backing preserves and can actually increase the value of a poster. For the most part, any flaws will be fixed and the poster will appear to be in Near Mint condition. For more information about our. We do not always measure all of our posters exactly. Unless otherwise specified, poster measurements quoted above are approximate to the nearest inch. For example, if we say a one sheet poster is 27" x 41" its precise measurements may be closer to 26 3/4" x 40 7/8" (or something similar). This slight variance is quite common for all original movie posters. BEWARE OF "FAKE" MOVIE POSTERS! There are fakes, bootlegs, reprints, and reproductions of almost every popular movie poster. WE DO NOT SELL THESE AS ORIGINALS LIKE OTHERS DO! There are many unscrupulous dealers who successfully pass off these posters as originals. They have been doing it for years! These fakes are almost indistinguishable from originals, only experts can tell. They only discover years later when they sell them that they are worthless. Most are from popular movies from the 70's and 80s, but there are also really old ones and relatively new ones as well. They usually appear in insert size 14" x 36" and one sheet size 27" x 41". For more information about CineMasterpieces please see. We guarantee that all posters we sell are graded and described accurately. Unless otherwise specified in the description, ALL POSTERS ARE ORIGINAL MOVIE POSTERS original theatrical movie posters that were displayed or meant for display (unused) in theaters at the time the movies were released. We will put in writing that we guarantee it to be an Original Movie Poster. 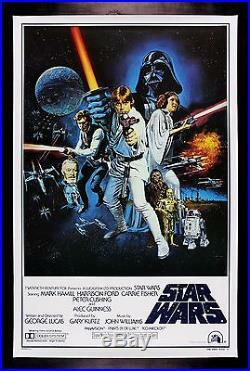 The item "STAR WARS STYLE C HAIRY BACK ORIGINAL BOOTLEG MOVIE POSTER CineMasterpieces" is in sale since Monday, June 19, 2017.